cream cheese on a hot dog. 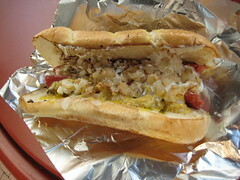 finally dear readers, i give you the cream cheese hotdog i ate way back in august in redmond, wa. the fine hotdog stand guy informed me that seattlites get their dogs with grilled onions, relish, and mustard, as well as the cream cheese. i should mention that before serving me the dog, the guy split the dog in half - well, more butterflied it - and grilled it, then spread the cream cheese between halves so it would get all nice and melty-gooey. also, i should note that i got the cream cheese for free, after telling him that i'd never had a dog with cream cheese before and chatting him up about different regional dog toppings. it was one fine hot dog. better than expected.